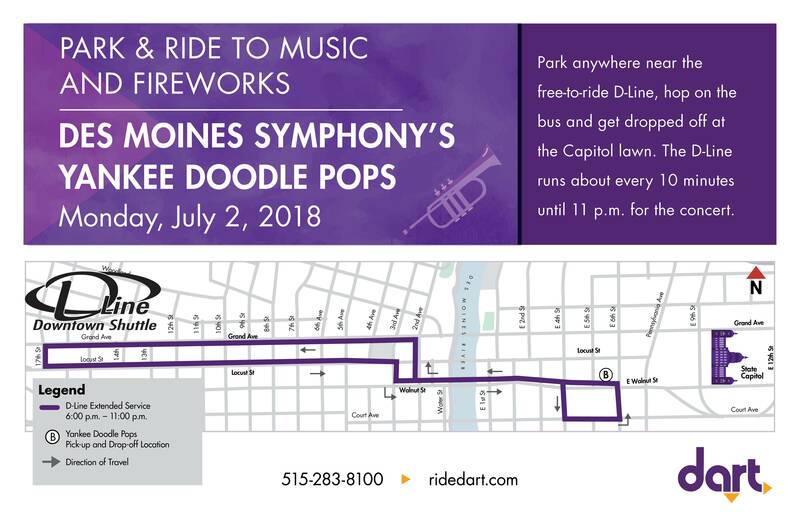 The hours of DART's free-to-ride D-Line will be extended to approx.11 p.m. on Monday, July 2, 2018, to take you to the Des Moines Symphony’s Yankee Doodle Pops concert. The D-Line runs primarily on Grand Avenue and Locust Street and uses the Walnut Street Bridge to connect to the East Village. Bus stops are located almost every block and marked specifically for the D-Line. Park anywhere near the route and ride FREE the rest of the way. The D-Line arrives at stops approximately every 10 minutes. Click the image below to view the route map. D-Line buses will drop off/pick up passengers on E. Walnut between E. 5th and E. 6th Streets near the Capitol lawn. Lawn chairs, strollers, blankets and coolers are allowed on the bus. There is no eating or drinking while on the bus, but you are welcome to bring food and beverages as long as they are in closed containers. For the safety of all passengers, we ask riders to keep the aisles clear and collapse any strollers or chairs they may have with them. Street parking at meteres is free after 9 p.m. and available on most downtown streets. Several free and paid parking garages are also located along the D-Line route. Click here to view a map of downtown parking locations. Where will the bus drop off and pick up near the concert? The bus will drop off on East Walnut Street right in front of the Capitol. The bus will pick up passengers at the same location and take them back to their vehicles. For Yankee Doodle Pops, the D-Line driver will drop you off on East Walnut Street, near the concert. If you are getting off at a different stop, please stay alert and remember to signal the driver about a block before your stop—you do this by pulling the cord above the window or pressing the stop button on the hand rails about a block before your stop.